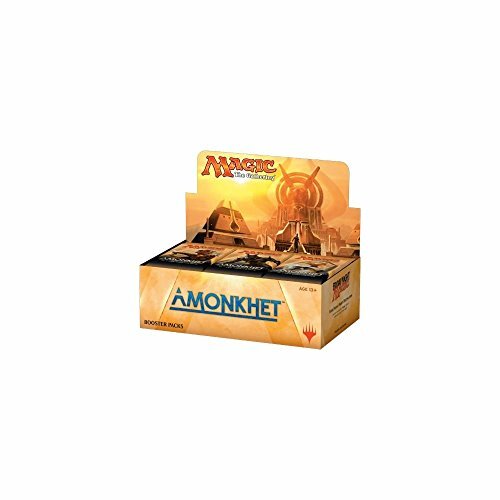 The Amonkhet master set has 264 different cards, each booster pack contains 15 random cards from the master set, so you have a chance to get multiple copies of the same card which is great if you need more copies of the same creature or etc for your deck! "The next step in the dragon's plan required self-sufficiency. A people who were willing to do the work themselves without the dragon's presence.. Finally, he made a promise to return, delighting in the writing of his own prophecies, and planting his promise in the gods and the minds and mythos of the denizens below. Mortals adored promises. They saw them as unmovable as mountains, when in truth they were mercurial as rivers.As the dragon departed, the small sun continued its slow journey across the sky. The time had come for the dragon to return to collect his hoard." Welcome to Magic The Gathering's Hour Of Devastation: Nicol Bolas has finally returned to Amonkhet and nothing will every be the same again. 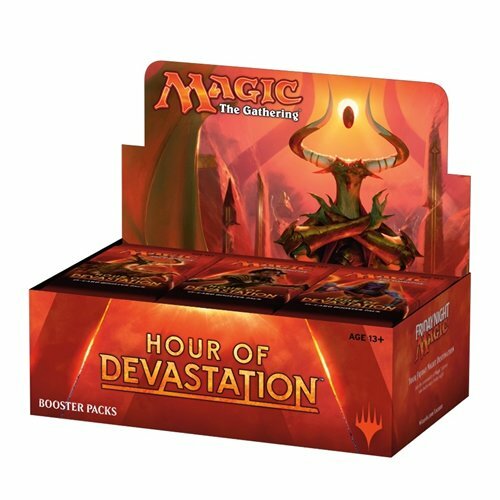 With all new new cards, mechanics, powers and abilities, the cards from the Hour Of Devastation set can help you buff your existing Magic deck or create a new one from scratch. 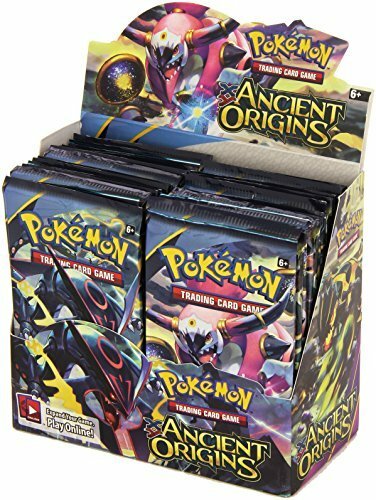 There are a total 184 different cards in the set, each booster pack contains 15 random cards. 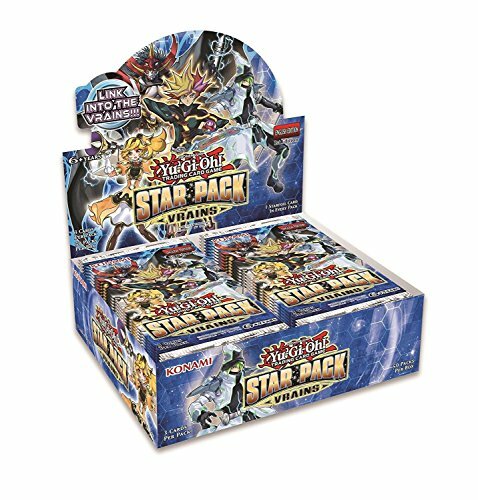 Yugioh 2018 Star Pack Vrains Booster Box - 50 packs of 3 cards each! Konami Digital Entertainment Inc. is proud to bring you the newest product release, Star Pack VRAINS. Following the advent of the Link era, Star Pack: VRAINS is filled to the brim with popular themes from Yu-Gi-Oh! VRAINS. Cyberse Monsters, Link Monsters, and more can be found in Star Pack: Each pack contains 3 randomly distributed cards with 1 guaranteed Starfoil Card. The cards are taken from a set of 50 cards, 49 of which are available as Commons and all 50 cards available as Starfoils. This means a whole bunch of cards never seen before as Starfoils, at a great value! For fans of Yu-Gi-Oh! VRAINS, Star Pack: VRAINS includes cards from the "Gouki," "Trickstar," and "Altergeist" themes! Duelists can now have an easy way to get popular cards like Trickstar Lycouris, Gouki The Great Ogre, and more! 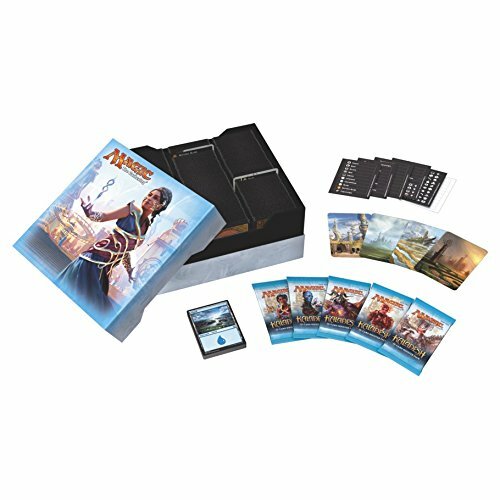 Magic The Gathering Kaladesh Gift Box - 5 booster packs + more! 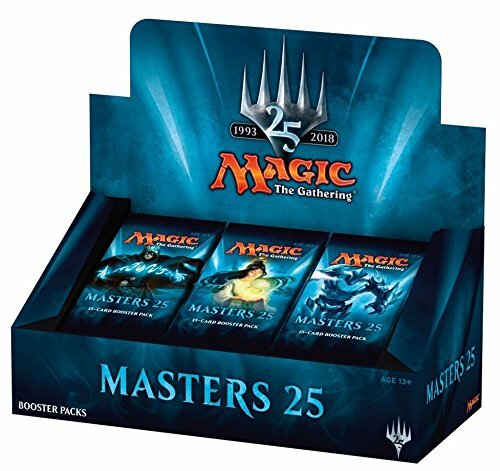 Description: The Gift Box is designed to be the go-to gift for shoppers looking to purchase Magic cards and accessories for their friends and relatives. It is perfect for storing a large collection of cards in a neat and orderly fashion. 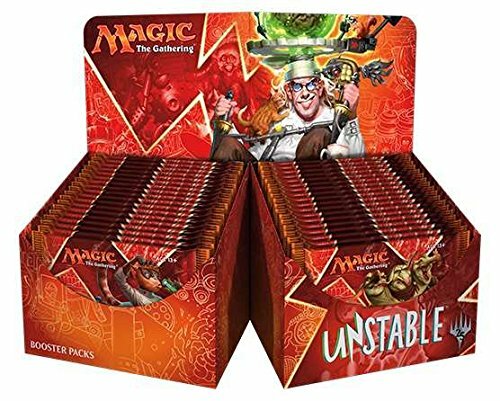 Unstable explores new areas of Magic game design and continues the tradition of bending the conventional rules of the game in a fun and whimsical way. Silver-bordered cards can do interesting and unique things that regular black-bordered cards don't typically get to do, all in the name of fun, and the set's creative elements reflect that spirit. Similar to previous un-sets, Unstable will be best experienced in limited formats like Sealed Deck or Booster Draft. 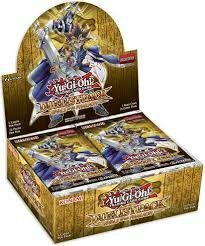 36 packs per box, 15 card per set. Look for randomly inserted rare full art borderless lands by legendary Magic artist John Avon!! Wrap your iPhone 6 in Sleek Style. 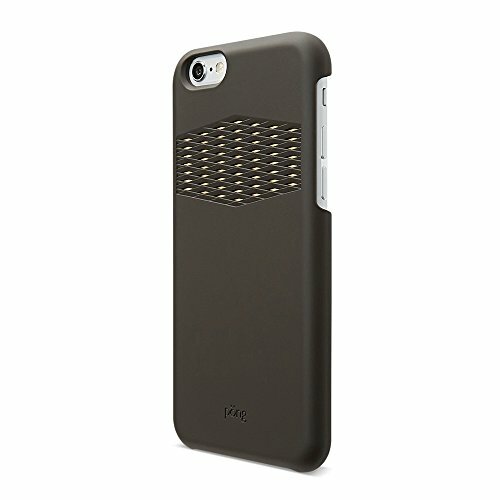 The Pong Sleek iPhone 6 Case brings protection to the next level – it redirects harmful radiation away from you while maintaining your phone’s signal. "The Kaladesh Inventors' Fair, a celebration of innovation and ingenuity, was a ruse. A revolt takes place on Kaladesh. The renegades have seized control of large portions of Ghirapur. Led by Pia Nalaar and aligned with aether-pirates, essence-drainers and weaponsmiths, they seek to overthrow the authority of the Consulate. The Consulate responds with increased security and surveillance, the seizure of unregistered inventions, the monitoring of aether distribution, and the enforcement of a city-wide curfew. The Gatewatch and Ajani Goldmane support the renegades, while searching for the nefarious planeswalker Tezzeret." Look for all new mechanics in Aether Revolt like 'Improvise' that enables you to pay a generic mana cost with the help of your artifacts, also look for new cycles and themes to continue exploring the world of Kaladesh. 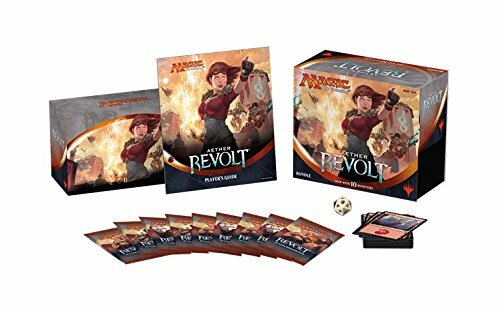 Aether Revolt products are available in the following configurations, make sure to check the Title and Description of each listing to determine which item or items are included in the listing. Copyright © Wholesalion.com 2019 - The Best Prices On Booster Case Online.